Ideas for Children While your Loved One is Deployed: Here are some ways author Karen Petty, Deployment Strategies for Working with Kids in Military Families, suggests parents and kids can stay connected with their loved ones while deployed. MilKidz Club from Blue Star Families is like a wing man for every single military child. MilKidz Club is all about cool events, free tickets, and tons of other happenings that all show our military children some well-deserved appreciation. Military Families Near and Far: A place where your family can create, communicate, and stay connected from Sesame Street and the Electric Company. Music, Art and more! This is a great tool. 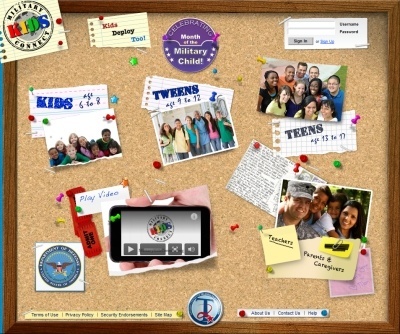 The DoD hosted Military Kids Connect site lets military kids connect with each other in a safe online environment and share their experiences. There are also some great resources for Parents and Educators. Those First Day of School Anxieties: Elaine Wilson from the American Forces Press Service had a few more good tips in "Tips Ease Transition to New School". Supporting Your Babies and Toddlers Through Relocation: A simple pamphlet from Zero to Three with ideas to make your move smoother for the youngest members of your family. Free Tutoring when your child needs it: Sometimes after a PCS it can be hard to get on the same 'page' as the rest of the students at your new school. Get help from a professional tutor anytime you need it at http://www.tutor.com/military. Tutors are online 24/7 and available to help in more than 16 subjects. Keep in Touch after a PCS: Families soon learn how the demands and excitement of a PCS can challenge relationships with family and friends at previous locations. Here are some ways you can stay connected with long-distance loved ones. Being a military child is not hard as everyone thinks. I feel proud to say that I am also a military child. Most of the people think that the life of a military child is boring. But for me, not at all. I never thought of another kind of life. I love being so. At times, I feel like it is impossible to go further. But at last I do it and feel proud to be a military child. When I see my dada deployed, I always fear what if something happened to him. But when I think of his bravery to serve our country, I feel happy to be his son. If I am good enough today, the credit goes to my dad and the military. The worst in being military is the process of moving to places from to another. It is very difficult to settle down in a place. When I start feeling good about a place, it’s time to move to another place. When I get close to my friends, it’s time to say good bye to them. This is the saddest feeling I had to overcome and I have to get used to it. But I love to take things positively. The good side of this process is that I can see every part of the nation and feel the beauty of each corner of it. My dad is the one who taught me to take things positively. But when I lived in Fort Polk, Louisiana, I really felt tired of it. When we were living there, hurricanes happened. We were forced to stay in our laundry room for 4 days. It was innermost room in our house and we were safe from the doors and windows. Those days were horrible. They made feel tired of being a military child. But my dad was right. Every day is not going to be happy. You have to overcome the situations by being brave.